On December 11, 2017, six researchers discussed initial findings based on observations of the Sun and on Earth gathered during the solar eclipse that stretched across North America on August 21, 2017. Ranging from new information about the way the Sun’s atmosphere generates heat, to how the dip in solar energy affected Earth’s atmosphere, and even how to protect against contaminating other planets with bacteria, the researchers shared their results at the fall meeting of the American Geophysical Union, in New Orleans. While total solar eclipses happen about once every 18 months somewhere on Earth, the August eclipse was rare in its long path over land: The total eclipse lasted about 90 minutes total, from the time it first reached the Oregon coast to when it left the North American mainland in South Carolina. This long, uninterrupted path over land provided scientists with a rare chance to investigate the Sun and its influence on Earth in ways that aren’t usually possible. During the few moments of a total solar eclipse, the Sun’s corona — otherwise too dim to see next to its bright face — is visible from Earth. 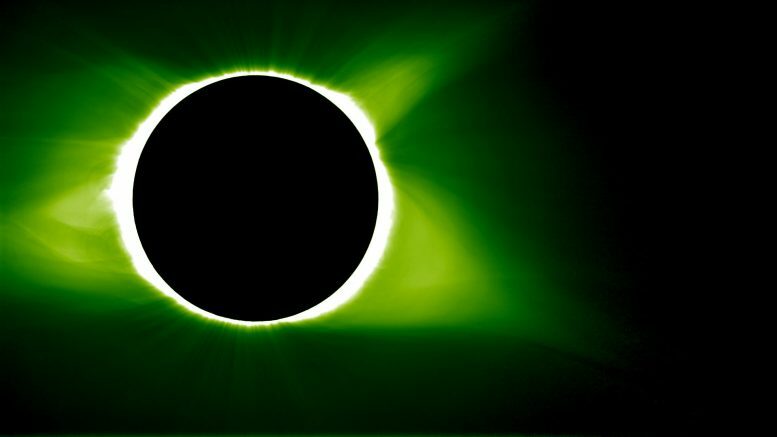 We study the corona from space with instruments called coronagraphs, which create artificial eclipses by using a metal disk to block out the Sun’s face. But the innermost regions of the Sun’s corona in white light are only visible during total solar eclipses. Because of a property of light called diffraction, the disk of a coronagraph must block out both the Sun’s surface and a large part of the corona in order to get crisp pictures. But because the Moon is so far away from Earth — about 230,000 miles away during the August eclipse — diffraction isn’t an issue, and scientists are able to measure the lower corona in great detail. Two scientists spoke at the press briefing about their research on the corona: Amir Caspi, a space scientist at the Southwest Research Institute in Boulder, Colorado, and Matt Penn, of the National Solar Observatory. Studying our Sun’s corona provides an opportunity both to understand what drives its intense heat as well as to improve our ability to forecast when the Sun could erupt with giant explosions of solar material known as coronal mass ejections, which can affect our space environment and — when intense — impact satellites. As Caspi explained: Depending on location on the ground, someone studying the Sun during the August 21 eclipse could collect up to 2 minutes and 42 seconds’ worth of data. But Caspi’s project, funded by NASA, took inspiration from past eclipse studies to stretch that time even further. Using a pair of NASA WB-57 jets, Caspi and his team had an uninterrupted view of the solar corona for just over seven and a half minutes. Though they were originally designed to help monitor space shuttle launches, the telescopes — and the jets on which they were mounted — were a surprising boon for solar science. This retrofitted science makes data analysis all the more challenging, as the images must be processed and calibrated carefully to reveal key details about the Sun’s magnetic waves and their relationship to the extraordinarily high temperatures in the solar corona. Matt Penn also took advantage of the eclipse’s path over land to get a unique set of observations. The Citizen CATE project — short for Continental-America Telescopic Eclipse — comprised of 68 identical small telescopes spread across the path of totality and operated by citizen and student scientists. During the eclipse, 61 of the project’s 68 telescopes managed to capture coronal images, amounting to 82 minutes of total observing time out of the 93 minutes that the total solar eclipse was over land. This success means that there’s a huge amount of data for the team to analyze — though Penn says they were able to capture detailed images of the solar features they were most interested in: Fast solar wind flows near the Sun’s north and south poles. Other scientists at the briefing presented results about the eclipse’s impact closer to home. High in Earth’s upper atmosphere, above the ozone layer, the Sun’s intense radiation creates a layer of electrified particles called the ionosphere. This region of the atmosphere reacts to changes from both Earth below and space above. Such changes in the lower atmosphere or space weather can manifest as disruptions in the ionosphere that can interfere with communication and navigation signals. Greg Earle, from Virginia Tech, used the eclipse as a natural laboratory to test models of the ionosphere’s effects on these communications signals. Earle and his team used computer models to estimate how the eclipse would affect radio signals — primarily, how far they could travel through the atmosphere before petering out. They predicted that the eclipse would extend the range of radio signals because of a drop in the number of energized particles in the ionosphere, similar to what happens at night. And they were right. Earle and his team used a litany of radio transmitters and receivers to test the range of radio signals during the eclipse: Two pre-existing radar stations, four custom-constructed antenna sites, and reports from thousands of ham radio operators from around North America, who volunteered their observations as part of a contest organized in conjunction with the American Radio Relay League. Validating this model of the ionosphere is a step towards understanding less predictable changes in the ionosphere that can impact the reliability of our communications and navigation signals. Angela Des Jardins of Montana State University spoke at the briefing about the Eclipse Ballooning Project, which flew balloons through Earth’s lower atmosphere during the eclipse. If you watched the eclipse online on Aug. 21, some of the live footage you saw may have come from these balloons. The balloons — flown to more than 100,000 feet by 55 teams of college and high school students — provided the first-ever live footage of an eclipse from this region of the atmosphere. Beyond providing great views, they also enabled unique science. The project incorporated weather balloon flights from a dozen locations to form a picture of how Earth’s lower atmosphere — the part we interact with and which directly affects our weather — reacted to the eclipse. These data revealed that the planetary boundary layer, the lowest part of Earth’s atmosphere, dropped down nearly to its nighttime altitude during the eclipse. Several dozen of the eclipse balloons also flew cards containing harmless bacteria to help us understand potential planetary contamination issues. “We don’t want to contaminate other planets when we send robots — or even humans — so we need to understand if microscopic life, like bacteria, could survive on Mars,” said Des Jardins. In many ways, Earth’s stratosphere is similar to the environment on the surface of Mars, with one primary exception: the amount of sunlight. But during the eclipse, the level of sunlight dropped to something closer to what you might expect to see on Mars, providing the perfect environment to test the hardiness of these potential Mars invaders. Scientists are looking at data from this experiment, and hope to have results to publish within the next few months. Jay Herman, EPIC lead scientist at NASA Goddard, presented on how the August 21 event gave scientists the opportunity to study the effects of the eclipse blocking some of the sunlight reaching Earth. This is a step in more accurately measuring the role of clouds in regulating how much solar energy reaches Earth’s surface, and how much is reflected back into space. Computer programs can estimate the impact of different types of clouds on Earth’s energy budget, and an event like the eclipse — where the Moon acts as a giant, impenetrable cloud — can improve those programs. The Deep Space Climate Observatory — a National Oceanic and Atmospheric Administration spacecraft that orbits 1 million miles from Earth and is always positioned between Earth and the Sun — provided a unique platform to view the eclipse and its impact. It carries an NASA instrument called the Earth Polychromatic Imaging Camera, or EPIC, which measures different wavelengths of light reflected off of Earth. When Herman and his colleagues measured how much light was reflected during the eclipse, they found that it was reduced by 10 percent across the globe. Regular, non-eclipse days typically vary by less than 1 percent, in comparison. Many other scientists – with NASA support – took advantage of the eclipse to conduct novel studies of the Sun and Earth on August 21. A NASA-funded group led by Shadia Habbal at the University of Hawaii found atypically cool material in the corona above an area where a coronal mass ejection had just erupted on the surface, prior to the eclipse. This finding is helping scientists understand the physics of dynamic plasmas in the corona. In Madras, Oregon, a team of NASA scientists led by Nat Gopalswamy from NASA’s Goddard Space Flight Center in Greenbelt, Maryland, pointed a new, specialized polarization camera at the corona, taking 50 images at four different wavelengths in just over two minutes. The images captured data on the temperature and speed of solar material in the corona. Typical coronagraphs use a polarizer filter in a mechanism that turns through three angles, one after the other, for each wavelength filter. The new camera was designed to eliminate this time-consuming process, by incorporating thousands of tiny polarization filters to read light polarized in different directions simultaneously. The team’s results were consistent with those of previous eclipses observed by the older, clunkier polarization cameras — successfully demonstrating that the instrument can be used to obtain accurate measurements without a polarization wheel. With further testing and development, the group’s camera will eventually mature into an instrument destined for spaceflight. Paul Bryans, a scientist at UCAR, led another NASA-funded project to study the Sun during August’s eclipse. They were able to capture a spectrum of the Sun’s corona at wavelengths stretching from about 1 to 5 microns, much longer wavelengths than those that make up the types of light our eyes can see. This spectrum is a measurement not often made, and Bryans and his team are hopeful that it will reveal interesting features about the Sun’s atmosphere. Bryans’ team also focused on capturing images of the chromosphere — the part of the Sun’s atmosphere below the corona — just before and after totality, when it would be visible beyond the Moon’s edge without being overwhelmed by the Sun’s bright face. Philip Judge, also from the High Altitude Observatory, led a team in close concert with Bryans’ to study the Sun’s corona and chromosphere with spectrographs — instruments that categorize light by its component wavelengths — to see the fingerprints left by the Sun’s magnetic field. This chromospheric flash spectrum, recorded with unprecedented time resolution, enables the team to study the chromosphere as a function of height at scales down to just a few kilometers. Analysis of these data is underway. Judge also coordinated with Smithsonian’s Airborne Infrared Spectrometer experiment. Preliminary results from this project show two previously unseen emission lines from the corona. These data were also cross-calibrated with ground-based coronagraphs used daily outside the eclipse and are giving researchers a clear understanding of the relationship between the corona’s emission and the light that Earth’s atmosphere absorbs. Working alongside the Citizen CATE project at two telescope sites, Padma Yanamandra-Fisher and her team used the August eclipse to measure polarized light from the inner solar corona, which can only be observed from the ground during a total solar eclipse. Studying the Sun’s inner corona in polarized light helps scientists track the signatures of solar activity that may help explain the corona’s extraordinarily high temperatures. Initial analysis shows the polarization was greatest along the Sun’s equator, showing where free electrons were more abundant, as well as other features in the corona. They also found a structure of ejected material — a prominence — was very weakly polarized. Yanamandra-Fisher’s team will also combine their data with that from Citizen CATE to help shed light on the short-period variability in the solar corona, which occurs on the timescale of just a few hours. 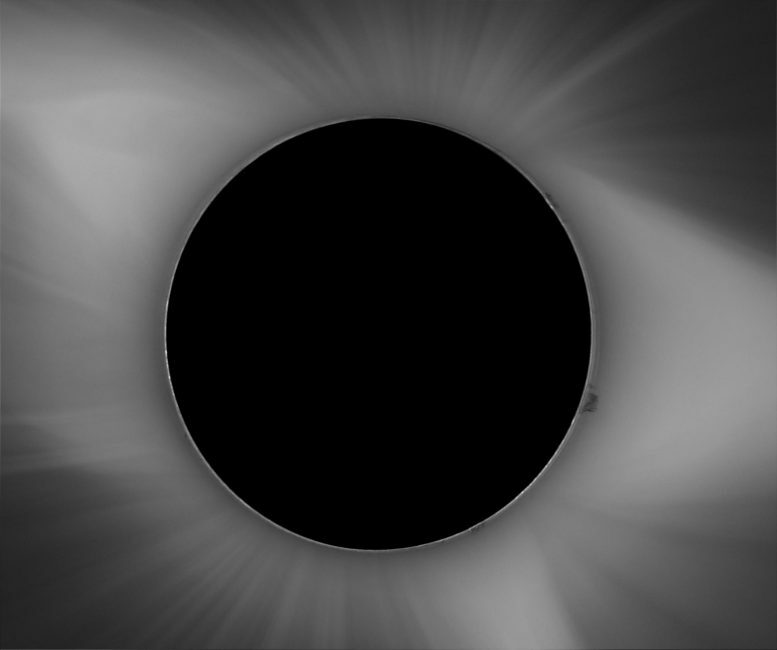 “The data set we acquired from one of our two sites is one of the best data sets of visible polarization of the inner corona available right now, because we had a pristine observing site in Tetonia, Idaho, and a great example of professional and amateur observer collaboration,” said Yanamandra-Fisher. As the shadow moved across the country, cutting off the ionosphere’s usual source of ionizing radiation, a team led by Phil Erickson of Massachusetts Institute of Technology’s Haystack Observatory observed circular bow waves — disturbances in the region’s electron density, named for their similarity to the waves a boat makes as it courses through water. These waves sped along the path of totality at 300 miles per second. Traveling ionospheric disturbances are sometimes responsible for space weather patterns in the upper atmosphere, and are often linked to atmospheric gravity waves. Bob Marshall and his team, from the University of Colorado Boulder, probed the response of the ionosphere’s D-region to the eclipse with very low frequency, or VLF, radio signals. This is the lowest and least dense part of the ionosphere — and because of that, the least understood. Data collection went well, Marshall said, and the group got all the data they were hoping for. The team collected VLF transmitter signals traveling across the path of totality in Boulder; Bear Lake, Utah; and Elginfield, Ontario, Canada. All the observations showed clear signatures of the eclipse, as well as an unexpected solar flare. Be the first to comment on "NASA Science from the Moon’s Shadow"